"A Boutique Experience Without the Boutique Price Tag!" Please see our policies page to learn more about paper options, shipping, refunds, colours, and more. Digital items are for personal use only and cannot be edited. Please do not sell printed items for profit. Copyright Tickle Tree Design. Our designs are created using digital imaging techniques and commercially purchased images from various sources. The copyright is not for individual graphics or fonts but rather it is on our design composition. Payment is required at the time of ordering. Due to the nature of our work, payments are non-refundable. The client is responsible for all shipping charges added to the order. Tickle Tree Stationery + Design assumes no responsibility for lost or damaged packages. We typically use Canada Post with tracked shipping, but courier service may also be available. Clients are responsible for any customs/duty or additional taxes if applicable. Typical delivery time after posting is 4 to 10 business days. Please note delivery time is not guaranteed and although it doesn’t happen often, packages can be delayed due to weather conditions, customs or peak seasons. Please allow plenty of time for mailing out your invitations. Shipping upgrades are also available. Tickle Tree Stationery currently ships within Canada or to the USA. Are you located near Victoria, British Columbia? If you would like to save on shipping costs, consider picking up instead of having us ship to you. Tickle Tree Stationery + Design owns the copyright to all digital files and images and reserves the right to use them for advertising, display or any other purpose thought proper. The buyer agrees to give irrevocable, perpetual and unrestricted right and permission to use, re-use, publish, and republish images of the client's stationery. Proofs will be provided to the client in digital form. While Tickle Tree Stationery + Design tries their very best to proof work for errors, it is the client's responsibility for final approval to the accuracy of the information including spelling, layout, dates and that the information is complete. Errors found after your final approval can be corrected but are at the client's expense. The client may find it helpful to have two or three other people look over the digital proofs as well. Printed colors may vary from what is seen on screen depending on the monitor, printer and paper type and quality. 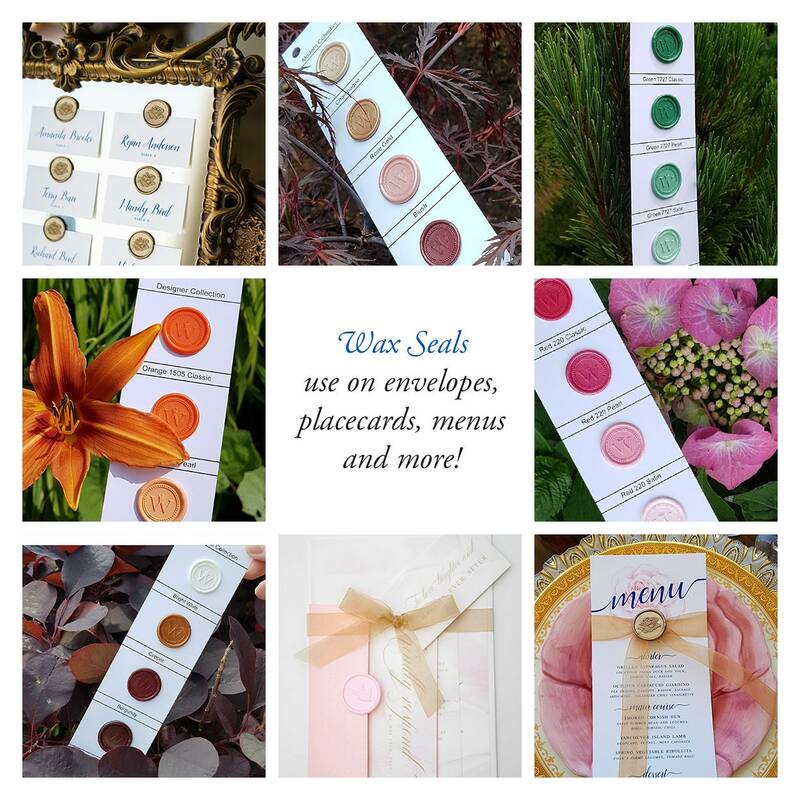 If unsure, it's best for the client to purchase paper samples before placing an order. Quotes and estimates we provide are valid for 30 days and are subject to change. Tickle Tree Stationery + Design's works are copyright protected. Items are created by us and with commercially purchased images through various artisans. We retain the right to use designs for the purposes of display and for other clients. Images of your stationery may be posted to the our social media pages. 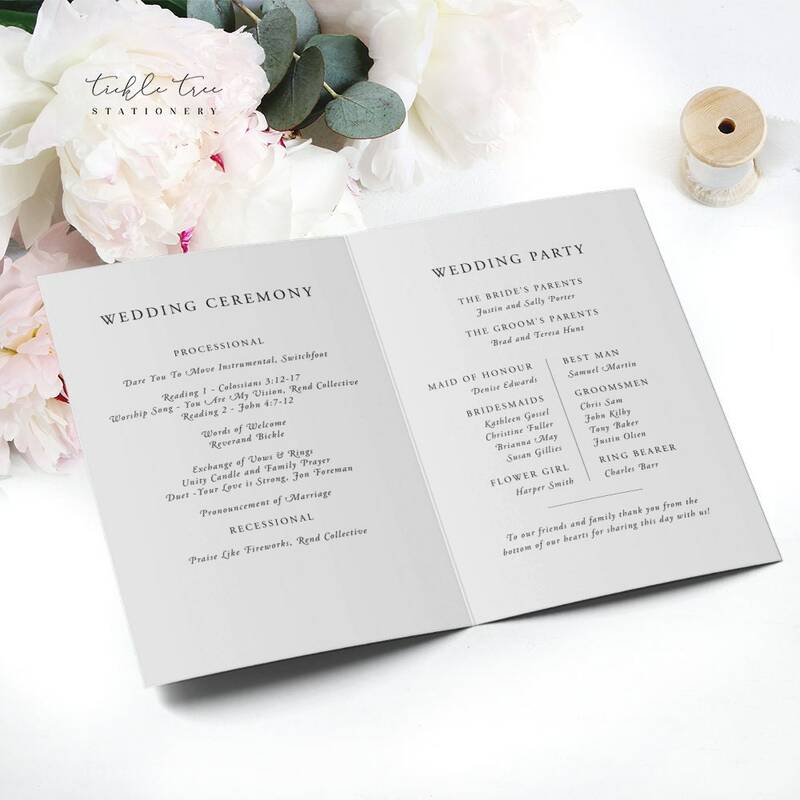 For custom design work, Tickle Tree Stationery + Design retains the rights to add the design created for the client to our semi-custom collection after the client's wedding date has passed. 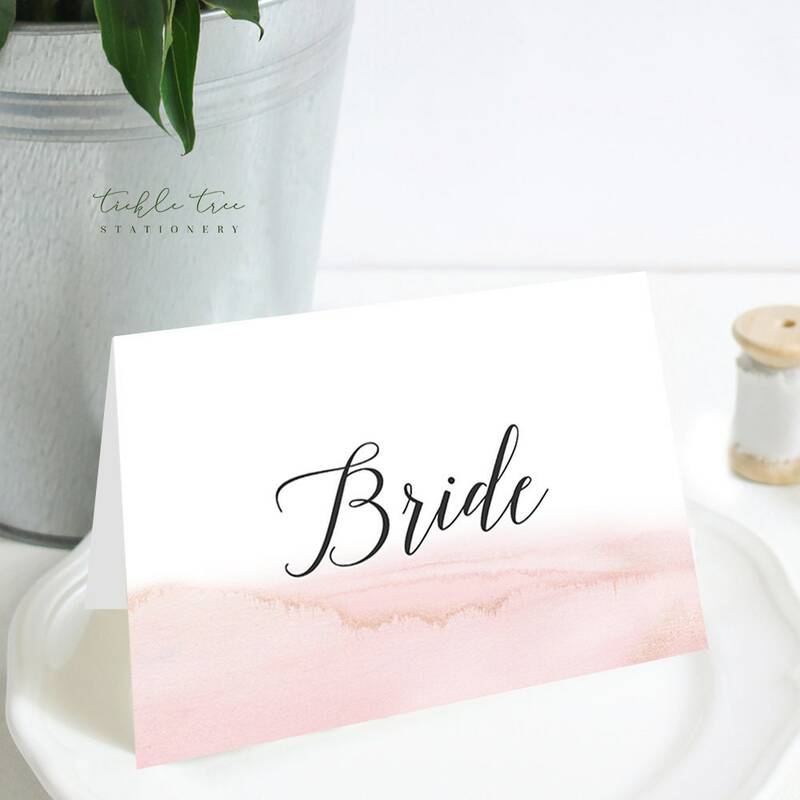 Individuality is very important and we welcomes images for inspiration, however the Tickle Tree Stationery + Design cannot and will not copy another stationer’s work. Because of the uniqueness and personalization of your stationery, orders are non-refundable. However, if you choose to cancel before we’ve received your final proof approval and before we’ve gone to print production, you are responsible for the 50 percent deposit and any additional items we may have purchased for your order. If we have already proceeded to printing we are unable to refund the remaining balance. There are no refunds on digital orders. In the unlikely event that Tickle Tree Stationery + Design is injured or becomes too ill to complete the project, we will make every effort to secure a suitable replacement. If the situation should occur and a suitable replacement is not found, responsibility and liability is limited to the return of all payments received for the event package. If the client does not want Tickle Tree Stationery + Design to find a replacement, the contracting party may choose to receive a refund instead. Colours ~ Printed colors may vary from what you see on screen depending on the monitor, printer and paper type and quality. If unsure, it's best to purchase paper samples before placing an order. Semi-custom designs are styles premade within our shop. 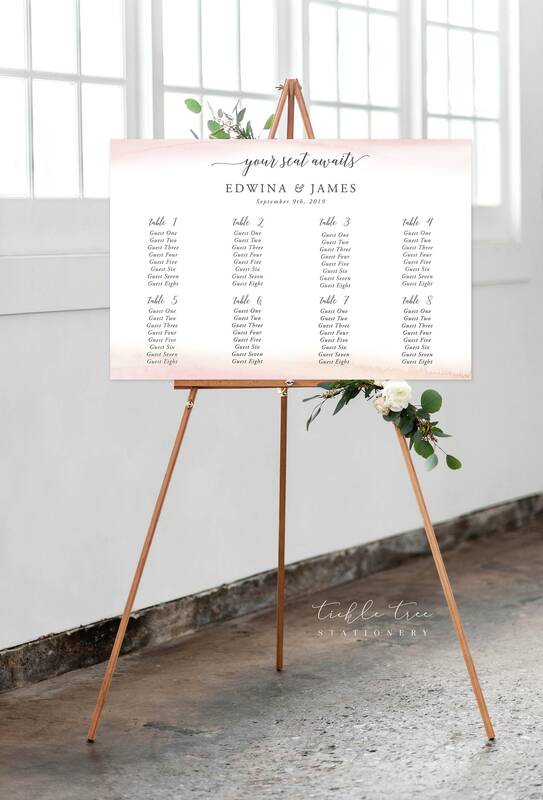 You can switch out fonts and font colours to get a more custom look for your wedding theme without the extra cost of a custom design. Are you looking for something more than font and colour changes? 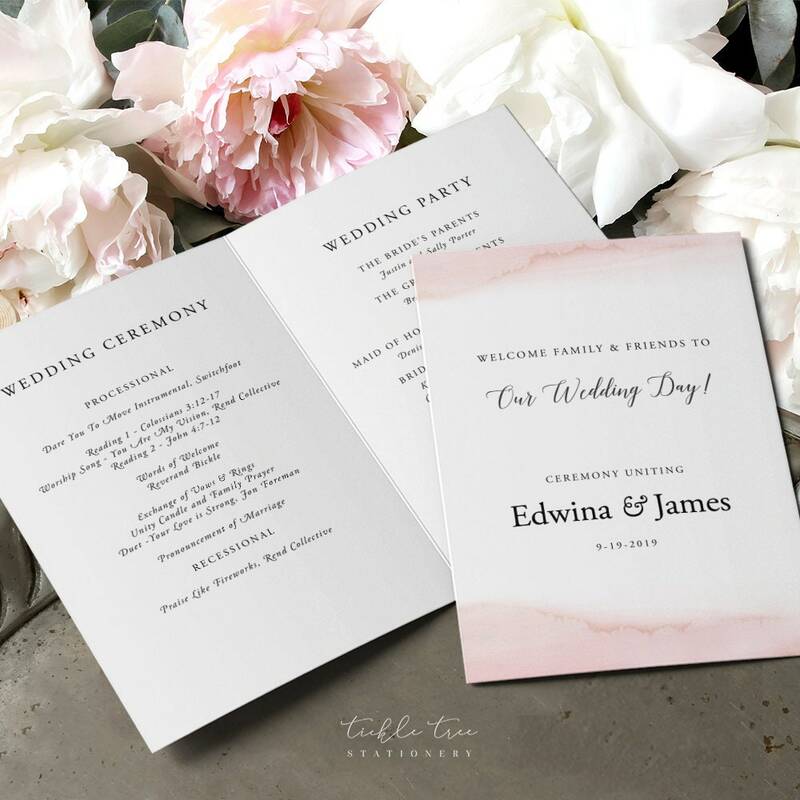 We offer custom design services which includes an invitation, rsvp card and one other insert card. We take on a limited number of custom requests each year and require a 6 to 8 week lead time.